Wilson golf balls are the next brand to be entered into my quest to find the best golf ball. Whenever I play a golf ball from Wilson I will post my review here. 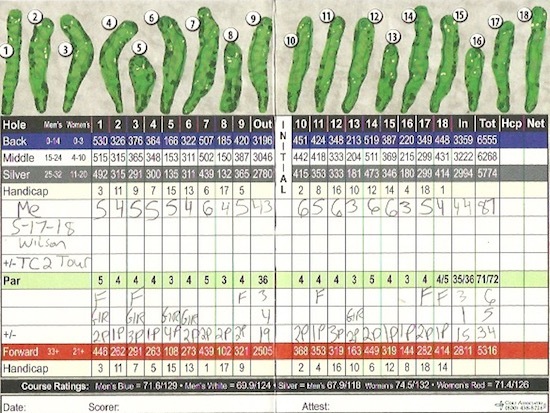 Just as I do with all of my reviews I play one round at Rackham Golf Course near my house in Huntington Woods, Michigan. I will admit up front to never buying Wilson golf balls in my golfing career. Maybe I’d play one I found but never had I bought some. 72 Degrees. Sunny. Light Breeze. The Wilson TC2 Tour is another golf ball my dad had laying around his workshop. And again, its a ball made for Maximum Distance and Maximum Control. We know from my dads other five golf balls I’ve tested so far that he has a thing for distance golf balls. I don’t know if he bought these as there is a Mt. Clemens Lions Club logo on them in recognition of their annual golf outing. My guess is he played in it and won these at the banquet or as a door prize. 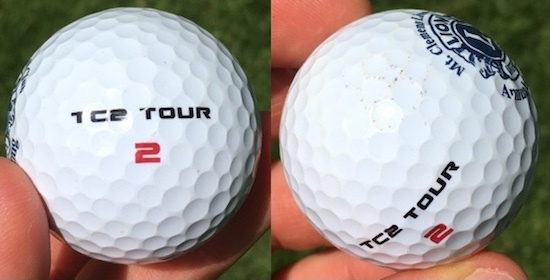 Saying that, it should be noted that the TC2 Tour golf ball was last produced over a decade ago. That means dad never thought about putting these into play and probably should have walked to the river behind their house and dumped them in. I mean, there are 15 brand new golf balls sitting here. And he never thought about using one ever. 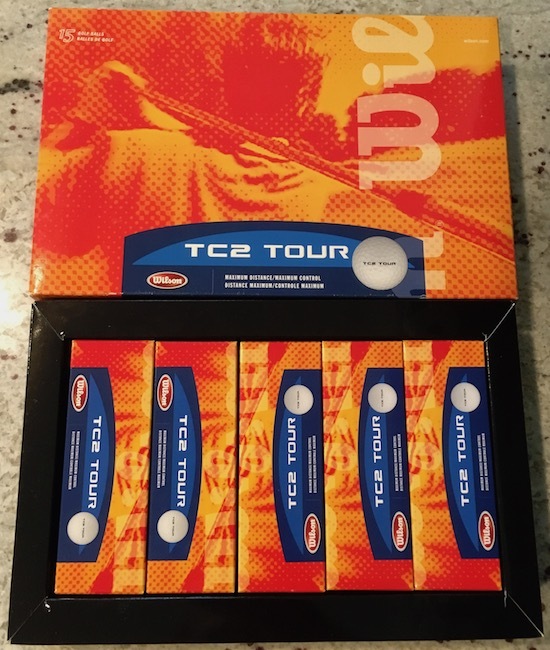 There is no manufacturing date on them and after doing some searching the last mention of the TC2 Tour on the internet is in 2010. So lets say these were made in 2008. Making them a decade old when I put them into play. Onto this two piece golf ball. The Wilson TC2 Tour has a “Resilient, cut proof ionomer cover (Really? Great!!) with a high powered core for maximum distance with optimum spin for maximum control.” YIPPEE! 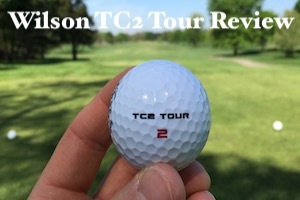 Off The Tee – I thoroughly enjoyed hitting driver with the TC2 Tour. Distance was very good when I made solid contact and ok on mis-hits. Hit 6 fairways which average. What I liked is I was able to hit my subtle draw with it. It really seemed to work well with my swing speed. On my mis-hits I did push the ball leaving me in some precarious spots. Had to punch out three times. Ball flight was mid trajectory which is a nice change of pace as I normally hit high. Fairway Woods & Hybrids – Accuracy was not great but it made one hell of a cracking sound. Used my 3 and 5 wood a number of times due to the slight breeze and the course being wet limiting balls rolling out. Distance was good. Had a green in regulation on the Par 3 13th hitting a towering 5 wood onto the green. The TC2 Tour had a very comfortable ball flight with the fairway woods. Didn’t have any full swings with hybrid, only punch outs. Irons – I was thoroughly surprised with the distance and accuracy I was getting with the TC2 Tour. I do not know if I was making better contact then normal but if I wasn’t on the green with my approach shots then I was just off. Had 5 greens in regulation with at least five other approach shots landing a foot off the green. Spin was non-existent. Not once did I see it check up. There was a considerable amount of rollout. But contact felt great. I typically share pictures of divots and where the ball ends up. And I did take a few pictures but this one says it all. The TC2 Tour hit pin high from 120 yards and rolled out 30 feet. Kind of sums up how it went all day. And that shot was with a 9 iron. Divot bottom left. Ball top left center. Why couldn’t you stop where you landed? ANSWER ME!!! Wedges – Not bad actually. With spin being next to null I had to play a bump and run on every shot. And thats what I prefer to do in most cases. Outside of one bad approach shot on #17 (short par 4) I’d say the short game wasn’t all that bad. Putting – And this is where the TC2 Tour struggled. One four putt. Two three putts. It did have six one putts which might sound great but I used my putter from just off the fringe, on the fringe, or from the fairway six times. I had 34 total putts but you could say I used the putter at least 40 times. And the TC2 Tour had a good feel as it left the putter face. Which kind of surprised me since this is not a premium golf ball even for mid 2000s standards. Durability -There are two small scuff marks which might be from the one tree I hit. Otherwise it is good for another couple of rounds. Score – 87. GIR – 5. Putts – 34. Fairways – 6. I actually liked the TC2 Tour. The font has a Terminator 2 look to it. Putting line with Wilson in it is simple. Not once did I think the TC2 Tour was a piece of crap. It was a decent all around golf ball. Its too bad that Rackham still had water everywhere from rains a couple of days prior. And that they had not cut the rough yet which made getting out harder than normal. The greens were extremely slow. Like, really slow. Over the river and through the woods of Huntington we go to the 14th green. The morning of was the first time they cut the fairways this year. It made so much more of a difference then when I played the Schwetty and Pinnacle Gold Long Drive the two weeks prior. Its mid-May. Says a thing or two about the weather we’ve had in Michigan so far in 2018.
Who knows, maybe in mid-July the TC2 Tour could put up a better score. And we will never know. Because that’s not how this works. I would play the TC2 Tour again though. It reminded me of the Vice Tour. A well rounded golf ball for a decent price. Correction, I don’t know how much they cost. Their 10+ years old!